Parachutes There are 7 products. A 1.8m2 (19ft2) rescue parachute dedicated to drones with a total flight weight of 1.5 to 4.9kg (3.3 to 10.8lb) that will allow you to have an impact energy under 69J. A 4m2 (43ft2) rescue parachute dedicated to drones with a total flight weight of 2 to 7kg (4.4 to 15.4lb) that will allow you to have an impact energy under 69J. 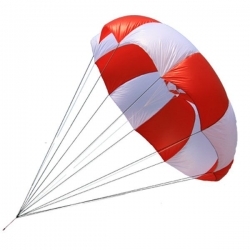 A 12m2 (129ft2) rescue parachute dedicated to drones with a total flight weight of 8 to 12kg (17.6 to 26.5lb) that will allow you to have an impact energy under 69J. A 15m2 (161ft2) rescue parachute dedicated to drones with a total flight weight of 12 to 40kg (26.5 to 88.2lb) that will allow you to have an impact energy under 69J (for 12 to 15kg (26.5 to 33.1lb) drones). 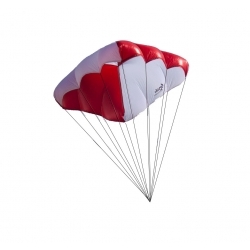 A 1m2 (10.8ft2) rescue parachute dedicated to drones with a total flight weight of 1.6 to 3.2kg (3.3 to 7lb) that will allow you to have an impact energy under 69J. A 3m2 rescue parachute dedicated to drones with a total flight weight of 3 to 6 kg (6,6 to 13,2lb) that will allow you to have an impact energy under 69J. A 7m2 rescue parachute dedicated to drones with a total flight weight of 3 to 9 kg that will allow you to have an impact energy under 69J.